COME AND TAKE A RIDE WITH US TODAY! 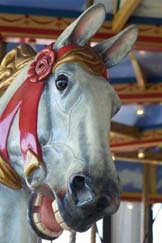 The Winter Wonderland Carousel opened in Grand style on July 1st, 2005 during a well-attended Canada Day celebration. 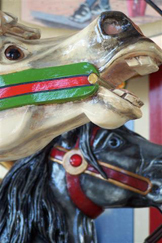 The Winter Wonderland carousel will be located for approximately 3 years alongside the original Heritage Carousel at the Waterfront until the rail lands are prepared for use. It will be housed on a cement floor under a large blue and white striped tent reminiscent of the circus tents of days past. This carousel is 28 feet across ... 6 feet larger than anticipated, so the original 14 carvings will need to be increased to 16 animals. For the time being, 2 spare horses from the first carousel will be used, but they will eventually be replaced with a lynx and a calf moose. 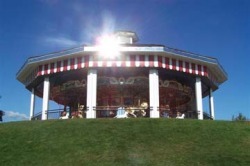 In late 1998, Barry Jacobs, a volunteer of the Heritage Railway, suggested to Rod Johnston, Chairman, that perhaps a carousel might be a good next addition to the attraction. A meeting was held at the home of Edna Scott, a local carousel enthusiast, and a business plan was developed. The administration of the City of North Bay were approached and supportive of the proposal. Todd Goings of Marion, Ohio, was contacted to rebuild a 1908 Herschell-Spillman mechanism. Chuck Kaparich of Missoula, Montana carved 28 horses and the North Bay Wood Carvers carved 9. Each of these horses were put up for adoption and were adopted in about three months. 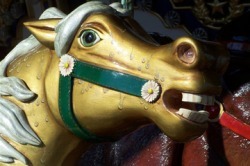 Other parts of the carousel where then put up for adoption, thus raising funds to pay for the horses, and to paint and furbish the Carousel. 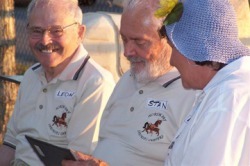 Local artists were approached to paint 33 horses and 28 original paintings of local scenes. A rocking chariot, stationary chariot, spinning tub and band organ were carved using local designs that reflect the wildlife of Northern Ontario. The carousel was assembled by its dedicated volunteers. reminiscent of all the creatures found in our Northern Ontario rivers, lakes and forests. Thousands of hours of volunteer labour went into creating these remarkably unique art pieces. The fine details and intricate design make every one special in it's own way.